The feather-loss disorder is an avian disease that leads to the loss of part of the plumage. It has been observed on a number of occasions in penguin colonies in South Africa and South America since 2006. Little is known about the disease. It is not even understood if it is caused by bacteria or viruses. 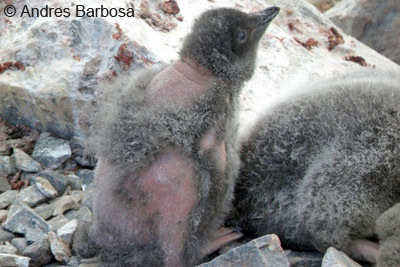 In January 2014, the feather-loss disorder has, for the first time, been observed in Antarctica. The Adelie penguin colony in Hope Bay, on the northeastern Antarctic Peninsula, is one of the largest of its kind in Antarctica, with about 120,000 breeding pairs. It is routinely censused every week by personnel from the nearby Argentine station Esperanza. In January, one chick, about 15-20 days old, was found with partly missing plumage, exposing parts of the skin. The remaining feathers were easily blown away even by wind gusts. Lice or other influences were not observed. The chick died 2 days later. Another chick was subsequently found in another part of the colony, about 1 kilometre away. This second affected chick could, however, not be investigated in any detail, as it disappeared and did not come back. Presumably, it died soon. No other affected penguins were observed. It seems accordingly that the feather-loss disease does not spread easily; it is possible that it affects only penguins with a suppressed immune system or a genetical disposition. It is unknown how the disease came from South Africa or South America to Antarctica. The risk of further spreading is also completely unknown. It seems, however, likely that staff from base Esperanza who had been in touch with penguin colonies in Argentina may unintentionally have brought the disease with them. Tourism might be another vector, but it is compulsory for tourists to disinfect boots and to clean clothing and other equipment carefully before arrival in Antarctica and any landing there, to prevent spreading diseases or alien plant species. Adelie chick with feather-loss disorder. Hope Bay, Antarctica, January 2014. Photo: Andres Barbosa.